I was craving a pumpkin roll today but making one of those was more of a project than I wanted to undertake. 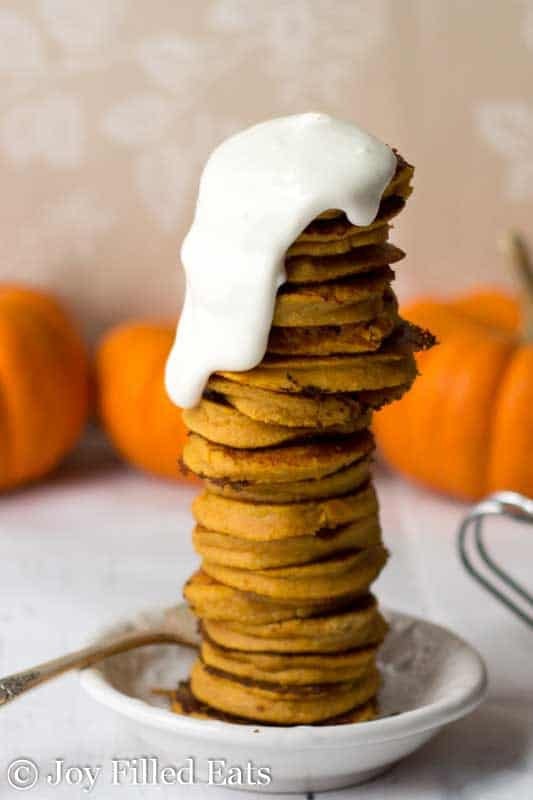 I decided to take the same flavors of pumpkin plus cream cheese icing and make pumpkin roll pancakes instead. If you follow me on instagram you may have seen my initial attempt at making this a waffle. I got to use my favorite hashtag #nailedit which was dripping with New Jersey sarcasm. With a blender 2/3 full of batter I decided to give pancakes a try instead and they came out perfect. You need to keep them small so they cook through and flip without breaking but there is something special about a plate of silver dollar pancakes. Especially drizzled with icing. I was halfway through making the pancakes when I realized I was out of cream cheese. My options were: drag four kids to the grocery store on a Saturday or make the icing with something else. I decided to trying making it with cottage cheese before I braved the supermarket. I actually really liked it! If you are out of cream cheese of just want to get in extra protein I encourage you to try the cottage cheese version. Combine all the ingredients in the blender putting the liquid ingredients in first. Blend until smooth. Preheat a large frying pan over medium heat. Spray liberally with cooking spray. 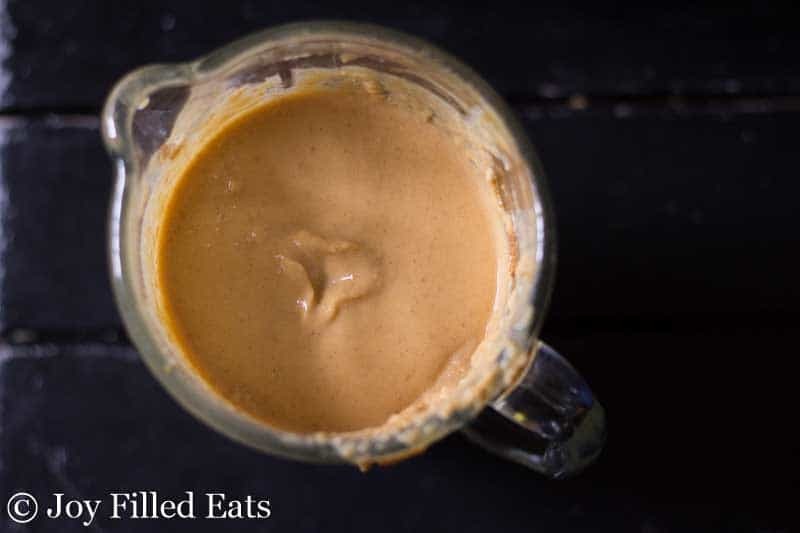 Drop tablespoons of dough onto the frying pan. I used a small cookie scoop for this. Cook well before flipping. To make the cottage cheese icing: Blend cottage cheese until smooth in a small food processor or rocket blended. Add the other ingredients and mix well. To make the cream cheese icing: Combine the cream cheese and sweetener and mix well. Note: Larger pancakes may not cook through and may break when flipping. 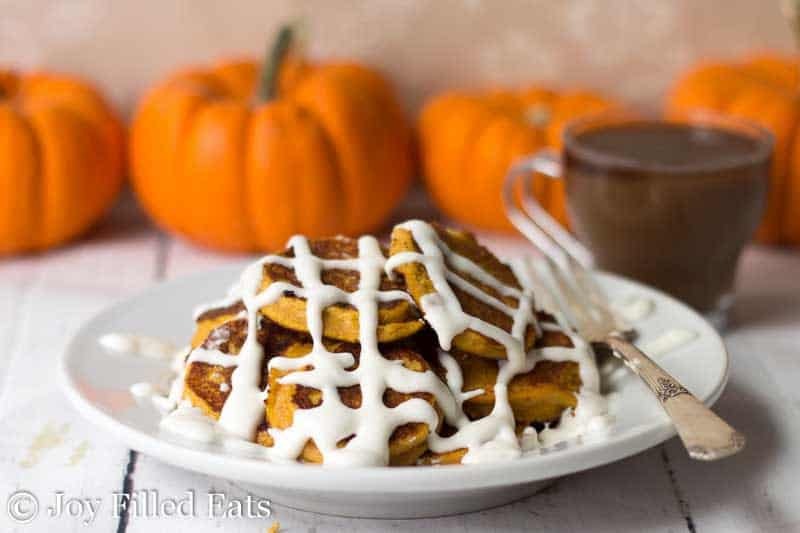 These pumpkin roll pancakes are like eating your favorite pumpkin roll cake for breakfast! 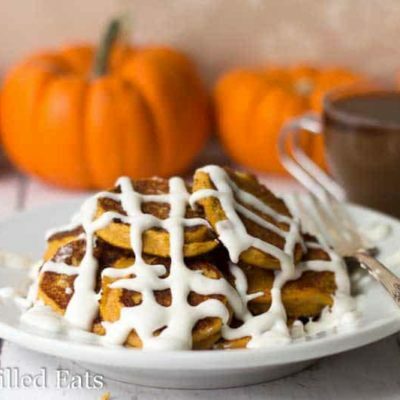 I just had these for dinner (love breakfast for dinner every once in awhile!) and they are delish! I love the wonderful pumpkin pie esque flavor. Bring on the fall!!! my batter was super thick and sticky. how did you flatten them out? i couldn't get any to cook through, at medium temp thet scorched and at lower they just stayed a mushy mess. Hi Jessica, I'm not sure why that happened. The batter shouldn't have been super thick. 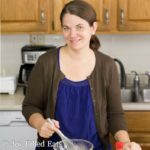 Did you use baking blend or 1/3 each almond, coconut, and flax? I love this recipe!! Definitely a keeper for me. I made 1/4 of the recipe for a personal serving, but next time I'm making the whole recipe for sure. Also, the cottage cheese icing is genius. ? I put maple flavor in mine and it was amazing!